The Executive Orders issued by the Trump administration over the past week have caused chaos and confusion throughout the country. Foreign nationals from all over the world are concerned about the impact on their lives and the lives of family members. This includes individuals in the United States with lawful status and our undocumented population. 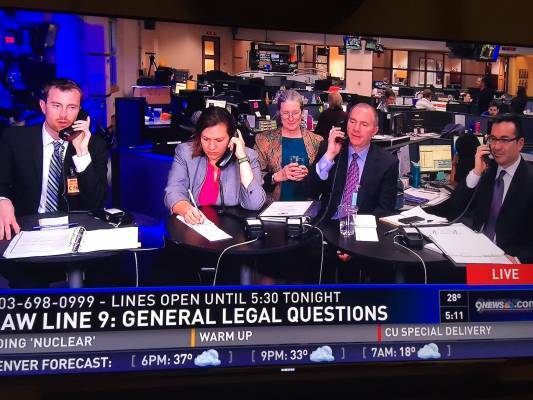 Last night, Managing Partner David Kolko participated in Denver’s 9NEWS’ Law Line 9. Mr. Kolko took calls from individuals from all over Colorado with questions about the impact of the new administration’s immigration policies and orders. For more information on Managing Partner David Kolko, our law firm, Kolko & Associates, P.C. or the legal services and counsel that we offer please contact our office.